Figure 7-11. The formation of carburetor ice may reduce or block fuel-air flow to the engine. Figure 7-12. 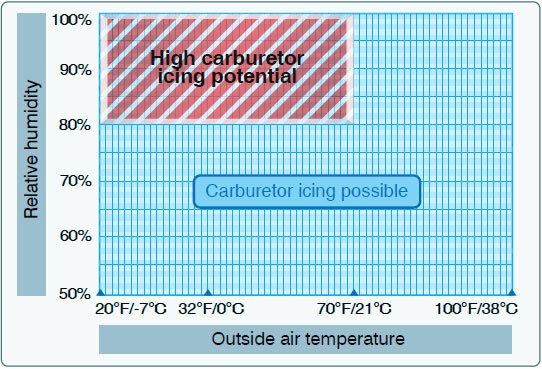 Although carburetor ice is most likely to form when the temperature and humidity are in ranges indicated by this chart, carburetor icing is possible under conditions not depicted. The first indication of carburetor icing in an aircraft with a fixed-pitch propeller is a decrease in engine rpm, which may be followed by engine roughness. In an aircraft with a constant-speed propeller, carburetor icing is usually indicated by a decrease in manifold pressure, but no reduction in rpm. Propeller pitch is automatically adjusted to compensate for loss of power. Thus, a constant rpm is maintained. Although carburetor ice can occur during any phase of flight, it is particularly dangerous when using reduced power during a descent. Under certain conditions, carburetor ice could build unnoticed until power is added. To combat the effects of carburetor ice, engines with float-type carburetors employ a carburetor heat system. Carburetor heat is an anti-icing system that preheats the air before it reaches the carburetor and is intended to keep the fuel-air mixture above freezing to prevent the formation of carburetor ice. Carburetor heat can be used to melt ice that has already formed in the carburetor if the accumulation is not too great, but using carburetor heat as a preventative measure is the better option. Additionally, carburetor heat may be used as an alternate air source if the intake filter clogs, such as in sudden or unexpected airframe icing conditions. The carburetor heat should be checked during the engine runup. When using carburetor heat, follow the manufacturer’s recommendations. When conditions are conducive to carburetor icing during flight, periodic checks should be made to detect its presence. If detected, full carburetor heat should be applied immediately, and it should be left in the ON position until the pilot is certain that all the ice has been removed. If ice is present, applying partial heat or leaving heat on for an insufficient time might aggravate the situation. In extreme cases of carburetor icing, even after the ice has been removed, full carburetor heat should be used to prevent further ice formation. If installed, a carburetor temperature gauge is useful in determining when to use carburetor heat. Whenever the throttle is closed during flight, the engine cools rapidly and vaporization of the fuel is less complete than if the engine is warm. Also, in this condition, the engine is more susceptible to carburetor icing. If carburetor icing conditions are suspected and closed-throttle operation anticipated, adjust the carburetor heat to the full ON position before closing the throttle and leave it on during the closed-throttle operation. The heat aids in vaporizing the fuel and helps prevent the formation of carburetor ice. Periodically, open the throttle smoothly for a few seconds to keep the engine warm; otherwise, the carburetor heater may not provide enough heat to prevent icing. The use of carburetor heat causes a decrease in engine power, sometimes up to 15 percent, because the heated air is less dense than the outside air that had been entering the engine. This enriches the mixture. 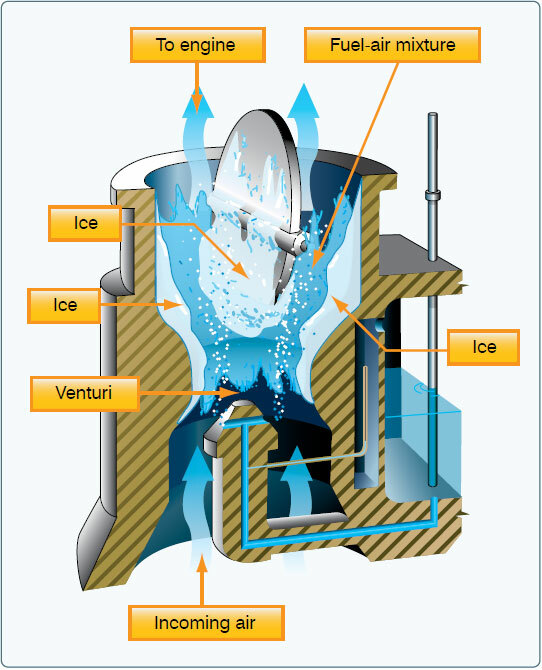 When ice is present in an aircraft with a fixed-pitch propeller and carburetor heat is being used, there is a decrease in rpm, followed by a gradual increase in rpm as the ice melts. The engine also should run more smoothly after the ice has been removed. If ice is not present, the rpm decreases and then remains constant. When carburetor heat is used on an aircraft with a constant-speed propeller and ice is present, a decrease in the manifold pressure is noticed, followed by a gradual increase. If carburetor icing is not present, the gradual increase in manifold pressure is not apparent until the carburetor heat is turned off. It is imperative for a pilot to recognize carburetor ice when it forms during flight to prevent a loss in power, altitude, and/or airspeed. These symptoms may sometimes be accompanied by vibration or engine roughness. Once a power loss is noticed, immediate action should be taken to eliminate ice already formed in the carburetor and to prevent further ice formation. This is accomplished by applying full carburetor heat, which will further reduce power and may cause engine roughness as melted ice goes through the engine. These symptoms may last from 30 seconds to several minutes, depending on the severity of the icing. During this period, the pilot must resist the temptation to decrease the carburetor heat usage. Carburetor heat must remain in the full-hot position until normal power returns. Since the use of carburetor heat tends to reduce the output of the engine and to increase the operating temperature, carburetor heat should not be used when full power is required (as during takeoff) or during normal engine operation, except to check for the presence of, or to remove, carburetor ice. Some aircraft are equipped with a carburetor air temperature gauge, which is useful in detecting potential icing conditions. Usually, the face of the gauge is calibrated in degrees Celsius with a yellow arc indicating the carburetor air temperatures where icing may occur. This yellow arc typically ranges between –15 °C and +5 °C (5 °F and 41 °F). If the air temperature and moisture content of the air are such that carburetor icing is improbable, the engine can be operated with the indicator in the yellow range with no adverse effects. If the atmospheric conditions are conducive to carburetor icing, the indicator must be kept outside the yellow arc by application of carburetor heat. Certain carburetor air temperature gauges have a red radial that indicates the maximum permissible carburetor inlet air temperature recommended by the engine manufacturer. If present, a green arc indicates the normal operating range.